So you want to start an online shop using the Showit website platform? Here’s how to get started using Showit and Shopify Lite or Showit and WooCommerce. A brand new template for educators and digital marketers, an online engagement session template, and a second pricing page design headline our latest releases. 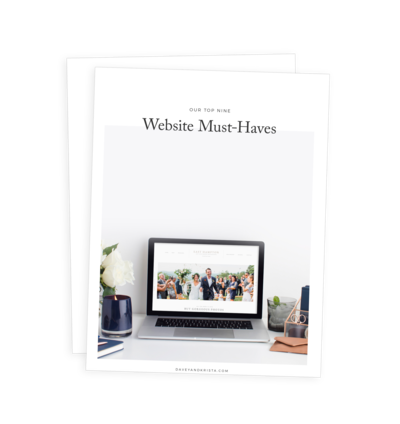 How I blog a wedding or portrait session in 30-minutes from start to finish in eight easy to follow steps. And what I do BEFORE the session to make blogging a whole lot easier. Showit vs. Elementor (WordPress) Which website builder is best for you? We’re big fans of both Showit and WordPress. Both are solid website platforms that provide a considerable amount of control over your website aesthetic and a great website building experience. Which website builder is best for you? FAQs, or frequently asked questions, are an effective technique for overcoming objections and educating prospective buyers on how they ought to be thinking about your product or service. We’re excited to announce that Positano, East Hampton, and St. Augustine are all now available for WordPress. And they’re just as easy to customize and as beautiful as the rest of the designs on our website.